"Global Warming? Not so much!" Data released recently from NASA confirms that February 2016 was the most "unusually warm month ever measured globally". 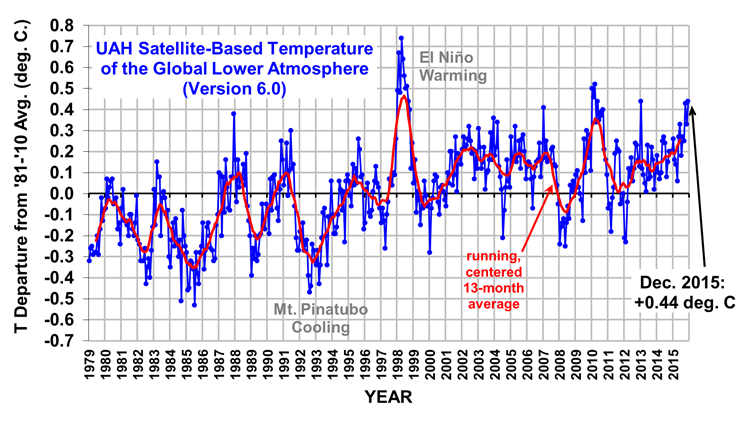 With all the hype of global warming, Feb 2016 is being touted as being the "hottest ever". For example, the Weather Network headlined its article on the subject: "February 2016 now ranks as the hottest month ever recorded". And 2015 is declared as being the "hottest on record" several articles. This of being "hottest ever" or "unusually warm" is not to be confused with "warmest ever measured." It means that in comparison with what was predicted by certain climate models, it was warmer. I just thought it was worth pointing out that this it is false to claim that 2015 was the hottest year on record. 1998 was hotter than 2015 or 2016. 2015/16 saw what is likely the most powerful El Niño since the satellite temperature records began. El Niño is a climate cycle in the Pacific Ocean with a global impact on weather patterns. The cycle begins when warm water in the western tropical Pacific Ocean shifts eastward along the equator toward the coast of South America. 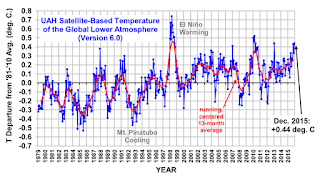 Satellite temperature readings going back to 1979 show 1998 was by far the warmest year in the satellite era, followed by 2010. It is worth noting also that results are only for the period since 1979. With a record El Nino, we should have experienced record high temperatures but this was not the case. We need to ask the question: "why is the world not as warm as we would expect?" The temperature measurements do show that we are in a period of global warming but a better headline would be: "Global Warming? Not so much!"